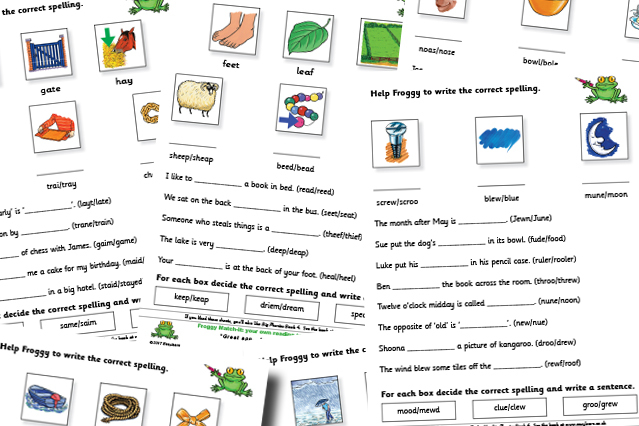 This month’s set of free sheets are called Froggy’s Which Spelling? They are ideal for supplementing phonics work relating to level 9 of the interactive Froggy Match-it games, and deal with the different spellings for the five long vowel sounds /ai/, /ee/, /igh/, /oa/ and /oo/. There are two sheets for each vowel sound and its different spellings: the /ai/ sheets, for example, deal with words such as train, gate and tray. This is a very important stage in phonics learning and needs a lot of consolidation. Once children have mastered this, they are well on their way to becoming good spellers. Get the free Which Spelling? sheets here.